Once again, and so quickly I can't believe it, Thanksgiving and the rest of the holiday season are fast approaching! Is it just me, or did this year go faster than last year? I thought that I would continue with the idea of gratitude games that I wrote about last year since I got a lot of positive feedback from many of our readers. 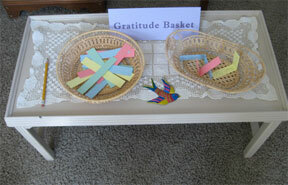 To see my article on gratitude games just click on the link. This year my gratitude games are even more interactive, especially for families with lots of relatives coming over for Turkey Day and also for families with a range of ages. Not all of them need to be played around the table, so your gratitude day can extend even past the meal! I think that it is so important to take the time to make gratitude a focal point of the holidays - with all of the rush it's easy to overlook being grateful. Some of these games will make great keepsakes for later too! I hope you play some of these with your families, and I hope you enjoy thinking of the many things you can be grateful for! Happy Thanksgiving!! This is a great game to play with a crowd, if you have a lot of guests arriving for Thanksgiving Day, or any special occasion in November! Assign someone (or a few people, if the size of your crowd would necessitate it) to be a reporter and someone to be the cameraman. 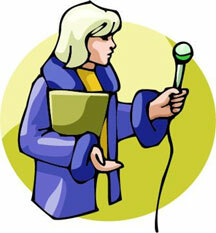 Have the reporter(s) interview the guests and family members about what they are most thankful for. The reporters can get creative with their questions, or a little child will make it a sweet performance, and then during or after dinner you can hook up the camera to the television for the evening's breaking news! If you don't have access to a video camera-the reporter(s) can simply give a live report on what they found during their interviews. This is a great game to get your teenagers involved! "Gratitude Pictionary" - Pictures are worth a thousand... blessings! After the big meal, you need a way to burn some calories and make room for pie, right? How about a rousing game of Pictionary, with a twist! Instead of drawing movie titles and the traditional Pictionary fare, each person draws something they are grateful for! All the same rules apply (no words, letters, or numbers, 60 second time limit, once a word is guessed play goes to the other team, etc.) You can use the board game that comes in a regular Pictionary set, or just enjoy drawing and guessing. 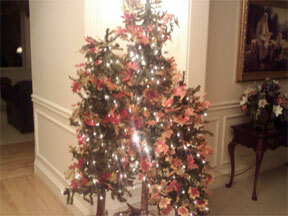 "Gratitude Tree" - A touch of the Christmas spirit in your Thanksgiving! I have included a picture of one of my favorite autumn decorations that my amazing Mother (who makes her home look like a catalog) puts up in her entryway every year. I apologize that it's not the greatest quality of picture; my camera is old if you can't tell! Anyway, every year she puts up some small Christmas trees for autumn, but she winds white lights and garlands of autumn leaves around them and the finished affect is SO cozy and autumn-ish. She actually has trees like this all through the house. Well, I suggest this year that you put up a gratitude tree using this decoration as inspiration - get a Christmas tree (either for the floor or a smaller tree for the countertop if you won't have a lot of guests) and wrap the white lights and fall leaves around it. Then, before your Thanksgiving dinner put out a small table with colored papers cut into ornament shapes (or stars, or whatever you prefer) and maybe some craft supplies like stickers, glitter, and sequins for decorating as well as markers and a hole punch and string. Then as your guests are mingling they can make an ornament, write something they are grateful for, and hang it on your tree! At the end of the party, the guests can take their gratitude ornaments home, or you can keep them and leave them on your tree. If you aren't going to be having a lot of guests over for Thanksgiving, just leave the tree and small crafting table up all month long and members of the family can continually add their gratitude ornaments to the tree, then on Thanksgiving you can read them all out loud. I guarantee that a touch of the Christmas spirit will only help to increase your gratitude through the month! "Gratitude Guess Who" - This is a great table game, or post-dinner game! As your guests arrive, have them each write down something they are grateful for and their name on a slip of paper and put them (folded up so no one peeks!) in a bowl or basket. 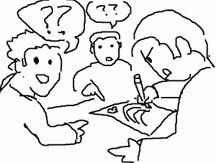 Then, around the dinner table or after the meal is over, have everyone take turns picking a paper and reading the item without reading the person's name and the group can guess. If you don't have a lot of guests or it's just your family, you can play several rounds with new items each round-for added difficulty give each round a "theme" such as: seasonal blessings, color specific, about a person in the group (aka, why we are grateful for mom/dad), something you can see at that moment, etc. "Gratitude Gab" - This game is guaranteed to get your guests talking! For the guests that have more to say than just, "I am grateful for food", this is the perfect game! Get a jar or bowl and have a few questions or topics on folded pieces of colored or festive paper. As the meal progresses, have everyone pass around the jar and take turns pulling out a piece of paper and answer the question or sharing the experience the paper asks. Instead of just saying one thing they are grateful for and moving on, these questions will provide conversations and stories that will enrich the lives of those present, deepen you feelings of gratitude, and nourish the heart while you feed your body! I have included a few sample questions below, feel free to use these or come up with your own.  Describe something lucky that happened to you last year and how your life improved.  Describe a peak experience from the year, what made it special, and why you are grateful for it.  Describe a special favor you received, how it helped you, and how it touched you.  Describe a special gift or talent you have, how you use it, and why you are grateful for it.  Name someone you know who makes your life better and why.  Think of something you used today that other people make take for granted.  What do you appreciate the most about the person sitting next to you?  Describe something you are particularly grateful for in your life and why.  Describe something that you do often that makes you happy and why.  Describe something that happened this past week that you are grateful for and why.  Describe something you have done that you are particularly proud of and why.